THE GOUGH MAP; DRAUGHTSMANSHIP, CONSTRUCTION, HISTORY. THE TECHNICAL TEXT THAT WAS OMITTED FROM PAPER Gm1. are some of their final comments. To try to solve some of the outstanding questions regarding the Gough map, I believe that it is necessary to dissect the map as a cartographical draughtsman should be able to do and thus discover the clues to its original setting out and accuracy. Although the Gough map appears to be visually a geographical map of Britannia, it is not. Let me be clear, the errors within the map far outweigh the visual pleasantry, when assessed from a cartographic rather than an historical viewpoint. For example, the Cornish peninsula is far out of position; Anglia extends beyond the North Foreland; Wales has an excessive land area infilling Cardigan Bay and completely omitting the Lleyn Peninsula and Bardsey Island: an historic pilgrimage site since the 6th century, the existence and significance of which would have been known to any cleric. The North Midlands are tilted decidedly westwards and this includes the North of England, and finally Scotland has been afforded a shape that has not been found in any text or extant map of the Middle or late Middle Age. Given the above problems (somewhat minor in the context of timescale, but nevertheless important) it has been decided to dismiss the use of cartographic distortion or comparison computer programmes such as the excellent MapAnalyst, not because it is not a superb tool but for the following reasons. Firstly, a visual assessment of the coast line and coastal towns which should be located thereon indicates that due to the vignettes used, such towns which should be coastal are drawn a considerable distance inland and therefore cannot be considered to represent their intended geographical position even, considering coastal changes. Secondly, there are a number of large vignettes scattered across the map which have the effect of distorting the positions of the adjacent towns relative to their true positions. Thus, unless the researcher chooses to denote a coastal point for a town drawn inland then any MapAnalyst comparison will be void; it would be a totally subjective operation as nowadays we know the precise location of coastal towns and would naturally position them thus. The same criticism applies to any analysis of the inland towns, whose positions have been displaced by the vignettes. 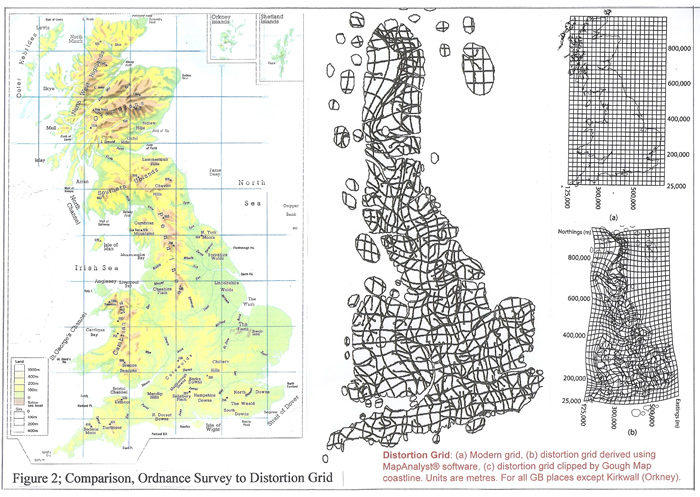 If the analysis carried out by Queen’s University is studied as shown on Gm2D02, the distortional grid using MapAnalyst software is obviously derived from subjective assessments of the coastline relative to the Ordnance Survey Grid. The O.S. grid and distortion grids are set on one diagram for comparison, with the distortion grid lines being 25km apart. Thus rather than rely on an averaging of the results, a graph format presentation which smoothly curves the distortion grid and would be totally unknown to the original draughtsman, I have chosen to use simple drawing techniques, using scale, straight edge and compasses to emulate the probable original methodology, but, with the advantage of a parallel motion drawing board. This I consider to be appropriate given the methodology for the original map. The Gough Map is 1164 x 553mm or c46 x c22 inches and would thus have been an excellent shape for ease of working. However, it is obviously cut to this final size, by how much is uncertain, but that would not impinge upon this methodology. Drawn on vellum/leather skins it would in all probability have been stretched on a frame to hold the skin taut. Thus we can immediately visualize the map base set on an angled or pivoting frame lengthwise with the width, c22inches running top to bottom. Thus the draughtsman had only c24 inches of base material to reach over in order to draw at the top or east of the map. I am using a parallel motion drawing board, 50 inches long and 36 inches wide and consider it a fitting alternative to the stretch frame. Place a stool under the frame and the map is easily drawn, from the seated, kneeling or standing position as necessary. The only unknown is when the necessity to join the two pieces was made, so that the final map could be drawn. Are we in fact still observing the original format of the Gough Map? That point is a question which will be answered in a speculative manner at the end of the text, bearing in mind the possible historic origins for the map and its necessary survey data. Was it originally just a map of England, Wales and the lowlands of Scotland, areas which were well known and surveyed by Roman geometres? The form of Scotland was no doubt well known to peripatetic monks, as the establishment of Religious Houses and monasteries attests. Therefore, was the data available to the draughtsman, very early original non-updated data from Rome for their British Province, and then later updated by data brought by peripatetic monks who travelled constantly to Rome and returned with texts? One such prolific collector was Benedict Biscop, the Abbot to the Venerable Bede. WHAT CAN WE LEARN FROM THE ROMAN SURVEY OF BRITANNIA? Gm2D03 and figures in texts Rm1, Rm2 and RmSu1 on this site. Studies carried out have been published by B.A.R and online at my specialist website. Basically it can be shown that the Roman Legionary Fortresses are deliberately sited by measurement from each other, and that Roman Roads are deliberately laid out to a regular pattern covering the landscape of Britannia as indicated upon Gm2D03. The simplified results of that research led to the finding of a most surprising tool arising from the deliberate positioning of Legionary Fortresses, a perfect 3:4:5; ratio triangle in the landscape using Cantium Promontory (CP = South Foreland) and Deva (Chester). The measurements as the diagram illustrates are: C.P. to Deva, 250 Roman Miles; C.P. latitudinally to Deva, 150 Roman Miles, precisely 2 degrees latitude Roman, and the easting from Deva to C.P. is precisely 200 Roman Miles. 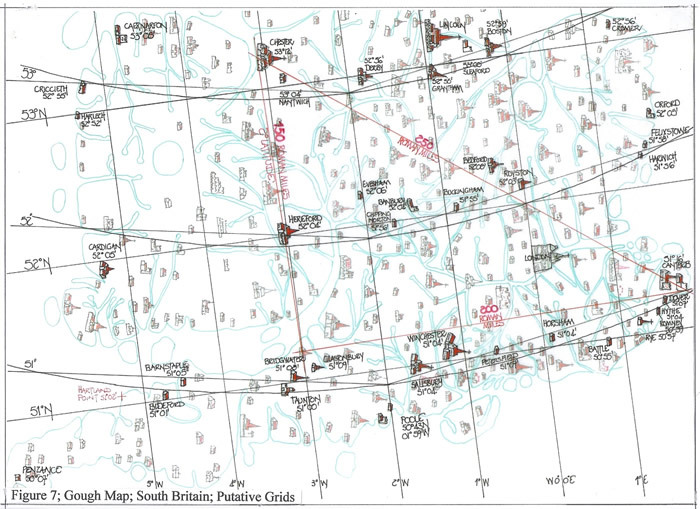 Add to that a definitive 3:5 ratio planning angle and it appears Roman geometres had been at work in our landscape. The Roman Survey is quite noticeable up to the Antonine Wall stretching between Dumbarton and Queensferry (Edinburgh), thus enclosing the lowlands from Hadrian’s Wall northwards. Rome explored further north towards the Moray Firth as the Gask Line Forts indicate and we have written records of a naval expedition around Scotland, it’s North Cape, to map the landscape profile. Thus we can be certain of a reasonable map of the landscape to the Antonine Wall. The error with the Cornish peninsula is hard to reconcile with any Roman Map, as is the shape of Wales, although certain early Codices of Ptolemy’s “Geographia”, including maps, could be seen as the forerunner of the Gough Map shape for Wales. In c150AD, Claudius Ptolemy wrote what is still considered a climactic geographical text. In his book “Geographia”, he lists over 8000 places in the ‘oikoumene’ (known world) by latitude and longitude: these co-ordinates can be used today to draw acceptable maps. When drawn out in the Middle Ages, the co-ordinates for Britannia produced a map of some similarity to the Gough Map as Gm2D04 indicates, but for Wales only St. David’s, Octapitarum Prom is evident. The Lleyn Peninsula, Ganganorum Prom and Cardigan Bay are not. Little else of the Ptolemaic map is evidenced. Therefore we must recognise that using those co-ordinates today (see later Figure Gm2D12), compared to the medieval outline, the resultant Ptolemaic Map is significantly different. Thus, if we ignore the Anglian outline error thereon, (I believe this is a matter of a miscopy by one degree, with the maps of Claudius Ptolemy fully researched on the website), there are just the similarities noted. 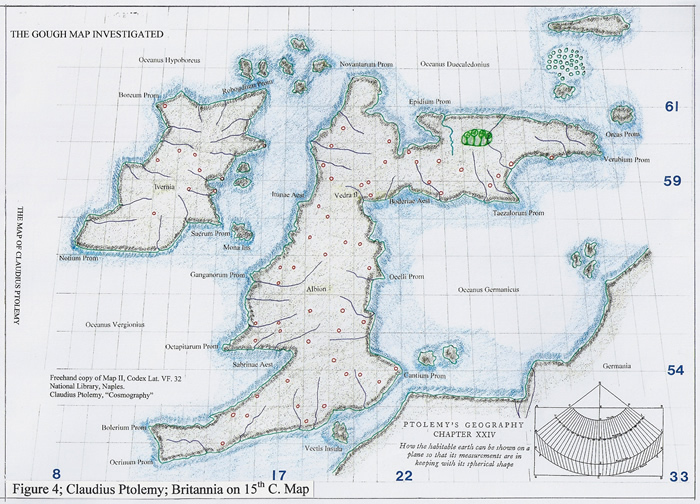 The form of the Island of Britannia, as Gm2D05 illustrates can be identified via numerous coincident points, coast or towns, to geographical co-ordinates. 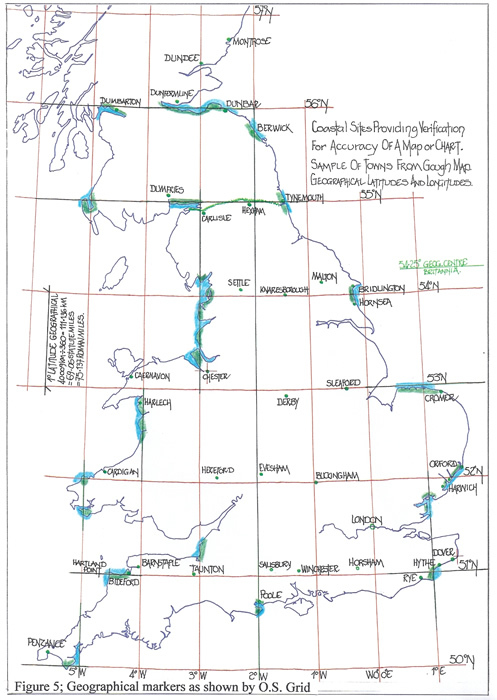 Study a map of Britain with the graticule superimposed and many features become very apparent as having significance. Therefore, presented with a supposed “geographical map”, these can be used to ascertain the accuracy of the map under consideration. Thus 51°N, 53°N, 55°N and 56°N are aligned to well defined landscape features and can be used. Longitudinally the 2°W line (which is also the centre line of the National Grid) from Poole Harbour to Berwick on Tweed can be used to ascertain map north. But if the putative Chester Triangle is used in conjunction with the 2°W longitude and their alignments are in agreement (or so close as to be acceptable given the age of the map), the map has the potential to be a geographically-based map. Thus we arrive at the formal investigation into the Gough Map, its draughtsmanship and technical basis. A study of the Gough Map will immediately show that there are only two or three vignettes which breach the coastline of the map. That implies all coastal towns are drawn within the outline and the coastal outline must have been drawn or at least marked out before the town vignettes were drawn. But to draw a coastal outline first there are parameters which must be established:, the latitudinal and longitudinal spread of the map, and hence a measurement for both. In the Medieval period tables of latitudes were being prepared in many ecclesiastical establishments, not only in continental Europe, but more importantly in Britannia. 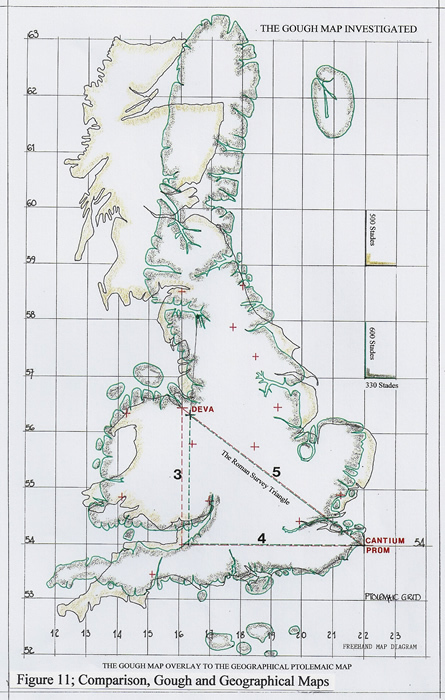 Therefore the idea of a uniform scale to portray these tables must have been in the forefront of the cartographer’s and draughtsman’s mind in setting out this map and a graticule would be the ideal basic format to plot a coastline particularly if there was extant a (Roman) map or maps of various parts of Britannia, perhaps making a complete map. It is therefore possible that the Gough Map could have evolved from older sketches combined with up-to-date (medieval) latitudinal readings. Thus I suspect the first lines drawn, albeit hidden lines in the final draft, were a graticule of latitudes and longitudes based upon these new ideas. But were the ideas originally a Ptolemaic design for the basic outline of the graticule? Consider this; Roman surveying data was transmitted to Alexandria and both Marinus of Tyre and Claudius Ptolemy were recipients of that data. Thus Claudius Ptolemy was enabled to write in his “Geographia”, published c150AD with details, very good details for the outline of Britannia. Rome occupied Britannia until the 5th century AD; was there no reversal of the flow of data; would not Rome have ensured the Governors and the Legions of this, one of the most important provinces, had the latest maps and data? Therefore, there is a period of c250 years for the transfer of Roman maps back and forward to Britannia, that is from c150AD to c400AD, when just after the Legions departed. Then in 1407 a Greek copy of “Geographia” was translated into Latin and maps drawn from the data it included. There is of course the possibility that Byzantine copies of the ‘Geographia’ were transmitted earlier via the Norman hierarchy as in 1154 Al Idrisi prepared a world map for King Roger II of Sicily using the Ptolemaic and other texts. It must also be borne in mind that Arabic was spoken at the Norman courts even in Normandy, France. In 1414, the ‘Church’ held a council at Constance attended by both Cardinals and Bishops, including a large contingent from England. In fact the then Bishop of London was elected Cardinal and proposed as the next Pope. However, what dominated the by-lines of this conclave was a discussion concerning Claudius Ptolemy’s “Geographia”. In fact Cardinal Orsini required Pirrus de Noha to produce a world map from the information. This map is a fusion of a Portolan Chart of the Mediterranean Sea area, and Claudius Ptolemy’s “oikumene” with a soupçon of Claudius Clavers’ Scandinavia added thereto as Figure 6 shows. But Britannia is still drawn thereon as if following over 100 years of Portolan chart format which the three examples within Figure 6 clearly illustrate. The following text from chapter 17, HOC places the Gough map and Portolan Charts in perspective. The Gough Map does not follow the above discussed format, but is more akin to the actual map which can be drawn from the data within Claudius Ptolemy’s “Geographia”. This text should be borne in mind when the whole process of drawing the Gough Map is finalised here-in. Stage 1; Prepare the skin(s) on the frame, bearing in mind most were of a similar size from similar animals and the scale could thus be chosen. Did this require the joining of two skins? The scale is primarily for the background although “hidden graticule” which sets down the basic forma to construct the coastal outline. Thus stage 1 ends with a graticule very lightly marked upon the base material for use in plotting the juxtapositions of coast and town. Stage 2; Knowing their Latitudes and Longitudes, or their distance measures from each other, many coastal features can be plotted and the existing sketch maps of varying size, scale and accuracy incorporated into an overall schema to produce a coastal plot. The internal measurements of the Roman Survey, Fortresses, Roads and Itineraries would have ensured a coherent layout. The Chester triangle could certainly have set out latitudinal measures and ensured continuity of measurement. But it is very apparent that the coast line would be a basic outline with estuary entrances merely marked for future rivers to be drawn. Why? Because a large number of town symbols obscure the river courses and thus the courses cannot have been drawn until the vignettes were complete. Stage 3; Towns are now located within the coastline and their vignettes drawn, with” in all probability” toponyms included. This though is a moot point as some vary contre the river courses. Stage 4; Rivers are now able to be drawn using the towns as a guide to their routes. Stage 5; Travel distances via ‘Roads’(?) are now drawn as can be seen from the red lines of these routes crossing rivers. The notation for inter-towns distances is now added. Stage 6; Colour it all, draw the ship, salmon and any final presentation required. For this section of text,Gm2D07, D08 and D09 will join (they overlap) to form a complete large scale Gough Map Plot, but Gm2D10 and Gm2D11 are stand-alone maps. Using both coastal agreement and town placement a picture emerged of alignments across the map which could be quite accurately linked to the putative Chester Triangle and its latitudinal measure. There are three diagrams which set down the basic research concerning the towns which correspond to geographical latitudes and could be apprised for accuracy. Study the Queen’s University distortion grid plot and alignments become very real, even though they are basically awry because of maintaining rigidly the vignette position as a precise arbiter of the graticule and surmising the coastal geographical positions. Commencing with southern England, towns within 5’ of actual major latitudes, 51°N, 52°N and 53°N, were marked upon the map as Gm2D07 indicates. Bear in mind this was carried out upon a full Gough map and has been broken down into manageable sections for display. The same process was carried forward to the North of England, latitudes 54°N and 55°N, as Gm2D08 indicates, and finally for Scotland, 56°N to 59°N, as Gm2D09 indicates. Having ascertained these points and to test the map, two items were drawn; the Chester Triangle and the meridian 2°W from Poole Harbour to Berwick on Tweed. The north/south lines had to be clearly similar, that is parallel or nearly parallel for both items to enable a series of latitudes and longitudes to be drawn. The latitudinal measure or its approximation was given by the Chester Triangle, 150 Roman miles or 2° latitude. This measure also allowed the longitudinal spacing to be calculated based upon the cosine ratio of the central latitude. This ratio is used as illustrative of the instructions given by Claudius Ptolemy for drawing maps of countries or areas of land in which he states that the ratio at the latitudinal centre should be used. Then, either a rectangular graticule is constructed or a tapering graticule if the latitudinal spread of the country is excessive. As the overall map on Gm2D10 illustrates there are two choices; the natural ratio for Britannia based upon a reading of 50/58.5 degrees latitude and the Ptolemaic ratio of 0.55, the cosine for 56.633°N. At this point the southern latitude of 51°N was drawn as it can be positioned from the Chester Triangle base line, but the northern latitudes of the map were not known until the Chester Triangle latitudinal measure was tested upon the towns’ and littoral. Visually the first impact that the latitudinal information provided from the town’s positions was that they formed an arc of a circle from cNE to cNW via South. As these were sketched upon the map it became very apparent that they were progressively smaller arcs by radius, and hence in all probability drawn from a single centre point. To find the centre chords were drawn using the putative centre line of 2°W as the focal point and the centre assessed. This proved to be near Aberdeen, but with no apparent reason for the position. 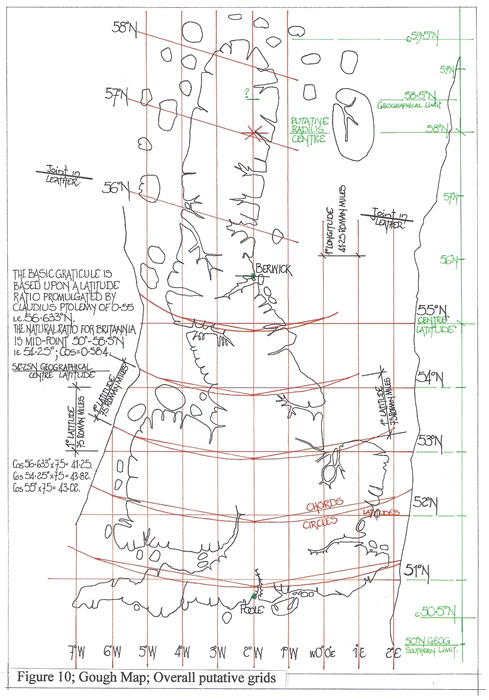 But the arcs were drawn from this point giving a clear positive reading for the findings and the latitudinal scale which could now be used with confidence upon the map. The measurement was the same as given by the Chester Triangle latitudinal measure of the 150 Roman miles which is 2 degrees. It then became clear that it was necessary to ascertain the original rectangular graticule as the putative centre was above the assessed arc lines where the latitudes of Scotland were in fact as I have adjudged sloping straight lines. Thus by using the average of the arc/chord system drawn, and the fact that the southern latitude of 51°N had been positioned with some accuracy, the putative horizontal latitudes appeared and corresponded quite reasonably with the coastal profile. When the measurements were extended northwards they provided not only a raison d’être for the putative radius centre of the arcs, (it is at 58°N), but also enabled the southern and northern limits of the map to be established by latitude as 50.5°N and 59.5°N. This of course determined the latitudinal centre of the Gough Map as 55°N, the Tyne /Solway alignment, and also the first or last arc/chord line that can be drawn. Thus there were now three latitudinal centre lines available; 56.633°N of Claudius Ptolemy, 55°N of Gough map and 54.25°N, the geographical centre line which give via their cosine ratio to the 75 Roman mile latitude measurement, 41.25, 43.02 and 43.82 Roman Miles for the longitudinal spacing. At this point it became reasonably certain that the draughtsman knew about the “Geographia” of Claudius Ptolemy and his dictum for the ratio of latitude to longitude for a local map being the latitudinal centre of the country. But it also raised the prospect of the draughtsman knowing of the first projection for a world map determined by Claudius Ptolemy of curved latitudes and straight longitudinal lines. Had the draughtsman cleverly incorporated both systems into the basic planning of the Gough map, much as Pirrus de Noha had melded a Portolan Chart of the Mediterranean Sea onto the Claudius Ptolemy map of the Oikoumene? Thus I finally chose the Ptolemaic ratio of 75 to 41.25 Roman miles to draw the whole graticule having in fact drawn all three to test the theory. Quite frankly, the difference between the three measures is so very small that it makes little or no difference to a final plot expressed in Ptolemaic degrees as shown on Gm2D11. Therefore the final technical data for the map had been determined; a hidden grid line system was drawn possibly in charcoal which could easily be rubbed out when the coast and towns were drawn in ink, or the coast was drawn and the towns simply marked for the vignettes to be drawn. It would be the towns which formed the latitudinal data collected or should we say measured by the various religious establishments or monasteries to form their astronomical tables, but the coastal information can only have been derived from previous maps when it was possible to survey them. The period preceding the drawing of the Gough Map was not a stable time for surveyors to wander the countryside and carry out such a task. The basis for the Gough Map is a Roman Survey from the years c75 to 125AD when the data would have been transmitted to Alexandria allowing Claudius Ptolemy to compose the “Geographia”. It should be noted that that text commences with the Island of Britannia. However in Britain only maps of the Roman Province limited to the line of the Antonine Wall were required and these were no doubt eventually copied and stored by the emerging monasteries and religious establishments. Then in 1407AD, the Alexandrian Greek of the “Geographia” was translated into Latin and at the Church Conclave of 1414AD it was circulated and copied with maps being drawn incorporating the new data of the ‘oikumene’. This included obviously the Ptolemaic methodology for constructing individual country maps and the ‘oikoumene’. Thus by c1420 the data were probably available in Britannia and it allowed a well versed draughtsman, not necessarily a cleric, but an educated person, to gather it all and produce the Gough Map with its peculiar Scotland profile. If the Gough Map had been even partially drawn from a copy of Ptolemy’s Britannia map, firstly the Ptolemaic map would have been known to be false and thus Scotland could have been altered by guess work, as it is doubtful the Roman data would have included it. Finally, I can turn to the probable measurement used to construct the map. The latitudinal spacing is c105/107mm which translates to 4 ¼ statute inches, 4 1/3 Unciae or 5 ¾ Digitus. Had our draughtsman used the basic natural measure of the “Ynch”, the thumb measure, then it is fair to opine the latitudinal measure is 4 local inches per degree. This is of course also the ‘natural hand’ measurement across the knuckles of the fingers. Thus the Gough Map is a properly constructed map of Britannia probably dating from the earliest c1420AD. This fact could now be ascertained by carbon dating both portions of the leather base as the date proposed is significantly different from the original proposed date of c1360AD. The latest textual analysis supports this by now stating the date should be after c1400AD and confirms my comments (2009) that Britannia could not have then been surveyed to produce such a reasonable coastal outline. I have already commented upon the fact that the base vellum/leather being in two pieces joined for an overall (cut) 1164 x 553mm format was probably unnecessary as the length is not too great that it could not be formed from a single skin. Purely speculatively; I reproduced the Claudius Ptolemy data for Britannia as a map to the same scale as the Gough Map and aligned them at Cantium Promontory, the ancient determinant for the South Coast as Gm2D12 illustrates. The Ptolemaic Map is subject to distortion by the turning of Scotland to ensure no land was above 63°N latitude. There is an apparent but actually misguided idea that Scotland is pivoted at Vedra Fluvium, it only appears thus. However it is an acceptable illustrative point to use. When the leather joint line is projected across both plots, and the north of the Gough Map, Scotland is then pivoted to match the Ptolemaic plot, the result is quite surprising. But does it mean anything? Can the joint be a change of mind in the draughtsmanship such that it was conceived as a Ptolemaic map and then altered to be a more geographical map of Britannia? Can it be just a copy of a Roman map which finished at the Antonine wall and was then extended? By any stretch of the imagination the joint is intriguing. 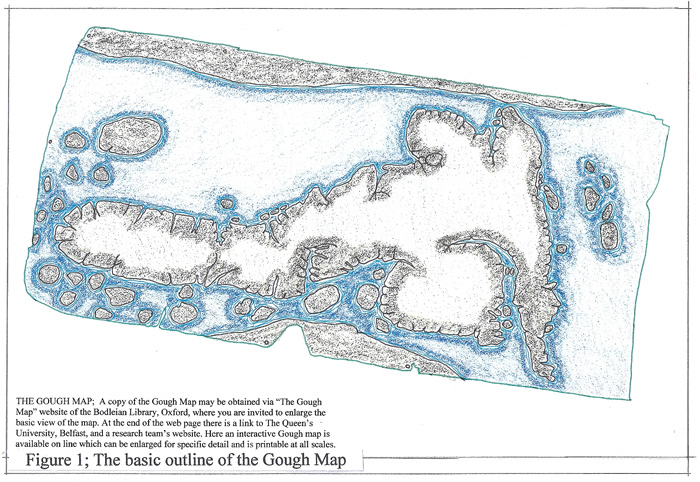 Gough map; held at the Bodleian Library Oxford and the subject of the “Mapping the Realm” project of lectures, TV programmes and a colloquium held at Oxford in 2011, entitled “The language of maps”. It is available at http://www.goughmap.org as an interactive digital map with excellent details. Lilley, K D. Lloyd, C D. and Campbell, B M S. (2009) ‘Mapping the Realm; a new look at the Gough Map of Britain (c1360)’. Imago Mundi, 61, Part 1, pp. 1-28. Lilley, K D, (2009) ‘Cartographic veracity in Medieval Mapping; Analysing geographical variation in the Gough Map of Great Britain’. Annals of the Assoc of American Geographers. 99(1). pp. 27-48.
e-Perimetron, Vol 1 No3, summer 2006. pp. 239-245. The software has been made available at http://mapanalyst.cartography.ch. It is well worth downloading. Corner, DJ. (1982). ‘English Cartography in the 13th Century, the Intellectual context’. Society of Cartographers. Paper presented at the annual summer school, St Andrews, September 1982. Ferrar, MJ. (2005) ‘The Venerable Bede and the Tabula Peutingeriana’. Cartographical Journal, 42/2, pp157. Ferrar M .J and Richardson, A. 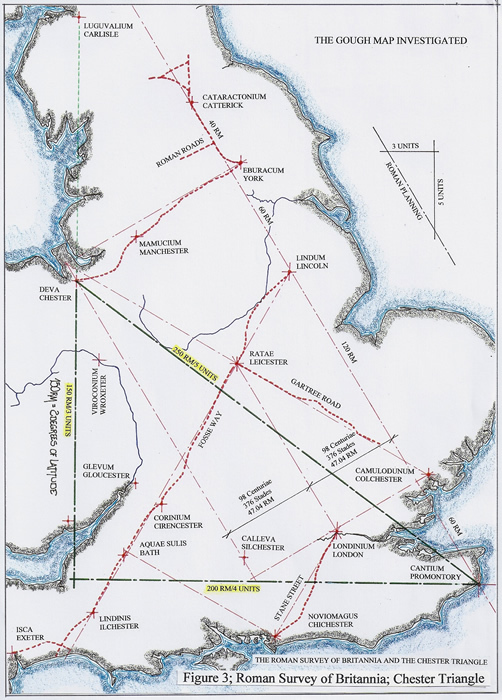 (2003) “The Roman Survey of Britain”. BAR British series 359, 2003. 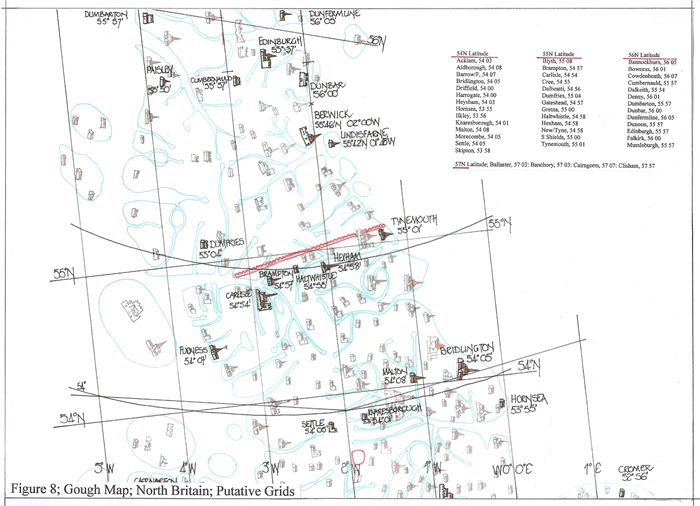 The maps and diagrams drawn for this paper and others are held by the National Monuments Record, Swindon. See also the Roman Page on this site which has several papers dealing with this subject and can be accessed via the home page abstracts Roman heading. Sheppard Frere, (1967 & 1974). ‘Britannia, a history of Roman Britain’. Routledge & Kegan Paul Ltd. London. Salway, Peter. (1993) ‘The Oxford illustrated history of Roman Britain’. QPD and Oxford University Press. Claudius Ptolemy. Copies of the’ Geographia’ as ‘Codex Lat V F. 32’, National Library, Naples, Italy and the ‘Zamoyski Codex’, Warsaw, Poland, in digital form are held by the author. Written texts include, “Cosmography- maps from Ptolemy’s Geography”, Magna books, Leicester, 1990, (taken from Lat V F 32) and Berggren, J Lennart. and Jones, A. (2000), “Ptolemy’s Geography, an annotated translation of the theoretical chapters”. Princeton University Press, Princeton and Oxford. Wright, J Kirtland. (1923). ‘Notes on the knowledge of latitudes and longitudes in the Middle Ages’. Isis, volume 5, No 1. pp. 75-98. Whyte, N. (1991). ‘Roger of Hereford’s, Liber de Astronomice iudicandi’. M Phil dissertation, Clare College. Edson, E. (2007).’The world map, 1300-1492’. The John Hopkins University Press, Baltimore USA. Chapter 5, pp. 114-140, “The recovery of Ptolemy’s Geography”, including, “The Council of Constance”, and the Pirrus de Noha map of the world. Brayley, E W. (1814). “The beauties of England and Wales or delineations topographical, Historical and descriptive of each County”, Vol X, Part II, pp.190-191, Longman & co London. This is a complete history of each County and includes the Church machinations with the Bishops travelling to Constance in 1414. Ferrar MJ. Website text, “Les Cartes Portolanes” (ChLcp/1)and other texts describing the whole genre. Harvey, PDA. ‘Medieval Maps: An Introduction’. HOC, vol 1, chapter 17. University of Chicago Press. Ferrar, MJ. Text ChLcP/1, Les Cartes Portolanes on the website Charts page. Hindle, B P. ‘The towns and roads of the Gough map (c1360)’. Private copy from author. Connor, RD. (1987). ‘The Weights and Measures of England’, Science Museum, London, 1987. Solopova. E, (2009), ‘The making of the Medieval Gough Map of Britain: manuscript evidence and historical context’. Private copy but an Imago Mundi paper originally. 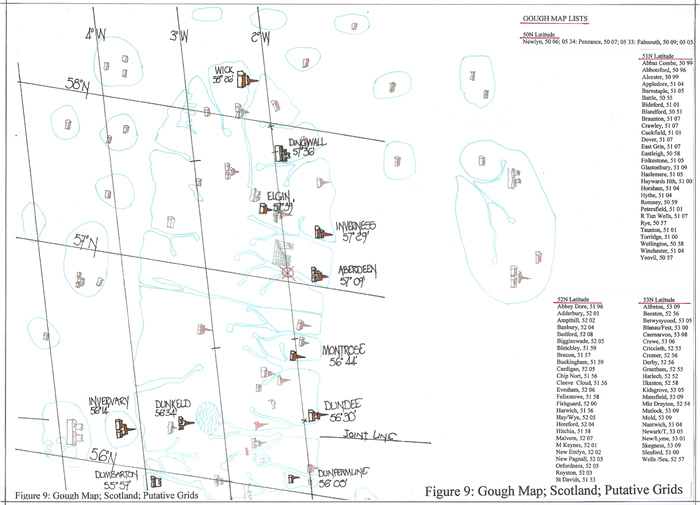 “Linguistic geographies: three centuries of language, script and cartography in the Gough Map of Great Britain”. Oxford, Bodleian Library colloquium paper of 2011. The author is grateful that Dr Solopova was kind enough to send copies of these texts and a following text and also confirm that she and others were well aware of my Gm1 2008 website text already noted. 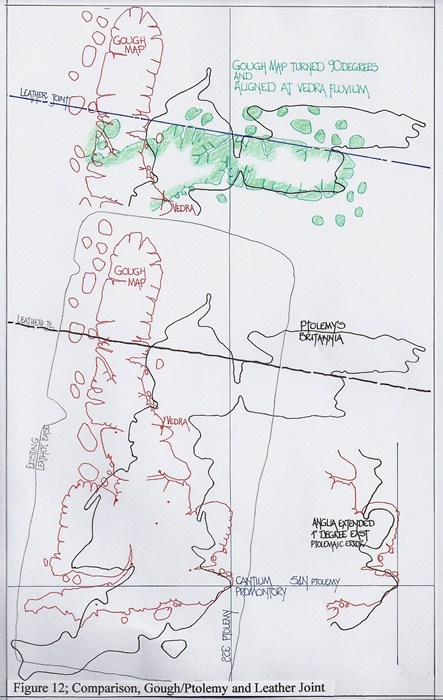 Smallwood, T M, (2013), ‘The making of the Gough map re-considered; a personal view.’ A personal copy from the author although it is an Imago mundi paper originally. It should be noted that the last paper uses arguments put forward in my Gm1, 2008 paper without mention. M J Ferrar December 2015.